Baked apples can be a great and healthy dessert to serve after meal, but also a delicious recipe to accompany a cup of tea. 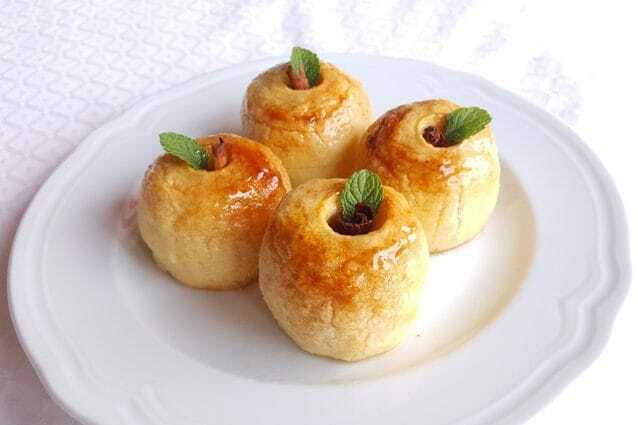 The preparation of baked apples is really simple and consists of very few ingredients, but the result can be surprising for both taste and aesthetics. and finish them by removing the remaining parts of the peel (4). Place the sugar on a plate and cover with it the entire surface of the apples (5). Then, put the apples in a casserole dish (6). Place a cinnamon stick inside each apple (7), pour the water (8) into the casserole dish and bake the apples in a hot oven at 200 ° C. When the surface of the apples begins to be caramelized, brush them with honey and bake them for other 5 minutes. To be sure the apples are baked, sting them with a toothpick: if it enters without too much trouble, they will be ready. Serve them warm. A more delicious variant of the baked apples is with the apples stuffed with a mix of raisins, pine nuts, almonds and cinnamon. In this case, it is best to add a bit of butter on each apple. White sugar could be replaced by raw cane sugar or even with muscovado. You can also flavor baked apples with mint or rosemary, and if you want, you can leave the peel using the top of the apple as a lid if you want to prepare stuffed baked apples. Another very delicious variant is to accompany the baked apples with ice cream: classically, with vanilla or milk. Always add water, it helps cooking and facilitate the formation of syrup. You can cook the apples even by cutting them into small cubes, like ice cream garnish, it is so good! For a more intense flavor of cinnamon, add a little cinnamon powder into the sugar. As an alternative to Golden Delicious apples, you can use the Reinette apples. Baked apple: a tasty idea! Apple and ricotta cake: here’s the secret to baking a fluffy and moist cake!